My last article based about painting a Mamod Steam Roller seemed too general about how to properly paint a steam roller. 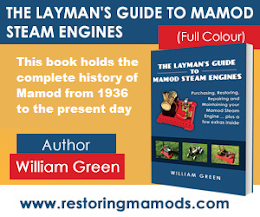 Today, I am focusing on how to paint the SR1's wheels or any other Mamod traction engine's wheels. I will go through the main mistakes people make when painting the wheels and explain to you how to overcome these problems. I did this on purpose to point out key mistakes people make. Don't ever paint any part of a Mamod without preparing the surface you are going to paint on. Here are some problems I occurred from not preparing the wheel's surface. Every roller and wheel when being cleaned will always have dent and chips in it from the wear and tear of being used over the many years. These little dents and chips are perfect places for the red paint to go because I physically can't reach them places. No matter what I used from white spirit to wet and dry, I couldn't reach these dents and chips to rub the paint off. Due to this, little spots can be seen over the wheel which were not there before. It is extremely important to prepare the inside rims of the wheels and rollers just before you paint them. You can do this through rubbing white spirit with a cloth over the parts you are just about to paint. This will ensure that microscopic dust is removed making the surface extremely clean. This will make the paint look much better when dried. You need to remember to let the white spirit dry before painting. This will only take a few minutes. However, if you are impatient, spraying on top of a wet surface will cause the paint to form in droplets. You can just about see that there is dirt in the parts around the centre where I couldn't clean it with spirit. Therefore, you can learn from my mistakes and use something like a screwdriver with cloth to get the dirt out of these areas.